Google is keeping the mobile friendly ranking boost, which rewards mobile friendly sites with a slight boost in mobile search results, with the upcoming mobile first indexing change. Also remaining the same is the current criteria for what makes a page mobile friendly or not. I asked Gary Illyes the question on Twitter, and he confirmed it. Right now, site owners need to only check their pages with Google’s Mobile-Friendly Test to see whether each page gets the mobile friendly boost or not. When this was first announced, Google would also add a “Mobile-Friendly” tag to those search results on a mobile device, but they removed it earlier this year when they found more than 85% of the searches results were mobile friendly. Google officially announced they are switching their desktop-based search index to a mobile index last week. 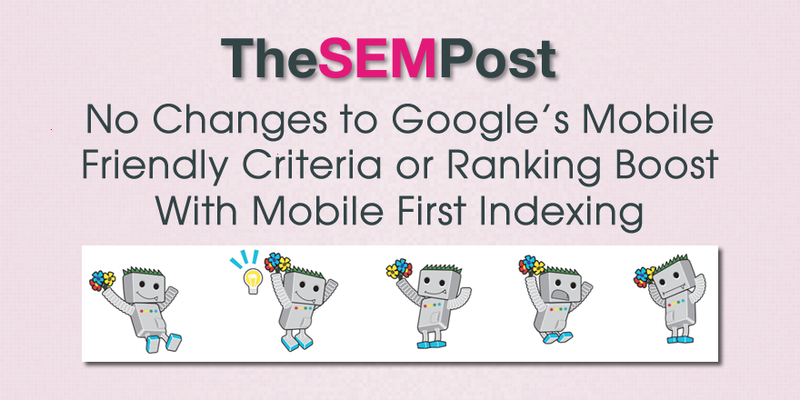 The SEM Post has a full guide on Everything SEOs Need to Know About Google’s Mobile First Indexing Change.